Rates of breast cancer vary among different groups of people. Rates vary between women and men and among people of different ethnicity and ages. They vary around the world and across the U.S.
After mammography was shown to be an effective tool to detect breast cancer at early stages of disease progression in the late 1980s, the use of screening mammography in the U.S. quickly increased. Learn more about how rates of screening mammography vary among different groups of women. For maps of breast cancer incidence in the U.S., visit the National Cancer Institute (NCI) website. This decline in mortality is due to improved breast cancer treatment and early detection. ** However, with 40,000 women dying from the disease each year in the U.S., Susan G. Komen doesn’t believe that’s good enough – and is why we have announced an aggressive goal to cut in half the number of breast cancer deaths by 2026. Washington D.C., Louisiana, and Mississippi have the highest breast cancer mortality rates. Hawaii has the lowest. ** Research in Colorado has shown that people diagnosed with breast cancer who live in communities with lower household incomes have lower long-term survivorship rates than those from more affluent communities. For maps of breast cancer mortality in the U.S., visit the NCI website. Black women have the highest breast cancer mortality overall. American Indian/Alaska Native women have the lowest. Learn more about disparities related to breast cancer in Colorado. 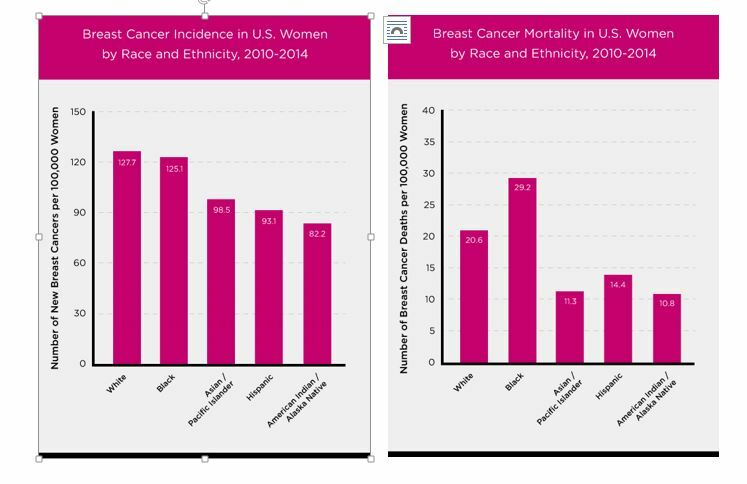 Learn more about national breast cancer statistics and disparities. *American Cancer Society. Breast Cancer Facts and Figures 2015-2016. Atlanta, GA: American Cancer Society, 2015. **American Cancer Society. Cancer Facts and Figures 2017. Atlanta, GA: American Cancer Society, 2017. ***Howlader N, Noone AM, Krapcho M, et al., editors. SEER Cancer Statistics Review, 1975-2014. Table 4.18. Bethesda, MD: National Cancer Institute. https://seer.cancer.gov/csr/1975_2014/, 2017.